By day and early evening, Blue Cargo’s two terraces on the beach serve food and cocktails. 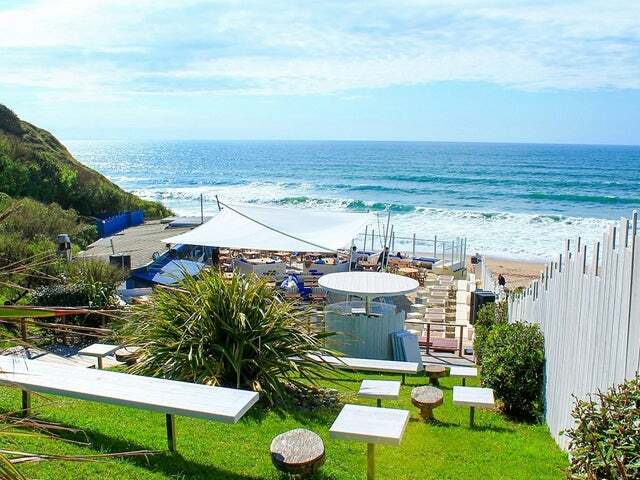 But by midnight they have transformed into one huge outdoor dance‐floor ‐ this is where the Biarritz party‐crowd comes to dance the night away with their feet in the sand and their heads beneath the stars. While the energy certainly increases as the sun goes down, there’s an upbeat vibe here whatever the hour, with DJs playing throughout the day. In the afternoon the tunes are tailored more towards lying in a sunlounger with a cocktail in hand (for a truly chilled‐out beach drinking session Blue Cargo also provides a relaxation area, offering half hour and one hour massages every Friday). As the evening progresses live musicians will up the tempo a little. And once night has fallen the big name DJs take over the decks, tables become podiums and the party really gets started. The restaurant is open for lunch and dinner, with a menu based on fresh local produce and seafood. For evening guests more concerned with drinking than eating, there’s a tapas bar where the taste of the Basque region is combined with Asian cuisine, fusing pinchos with sushi ‐ all accompanied by spectacular sunsets over the bay.